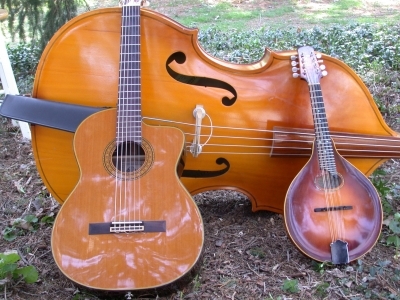 Our instrumentation is mandolin, guitar, and upright bass. We perform at concerts, clubs, festivals, and private functions including corporate events, wedding ceremonies, cocktail hours, receptions; parties, and dances. The Trio is extraordinarily versatile, and can add other accomplished musicians to meet your specific needs. The Bernstein Bard Trio is Steve Bernstein on mandolin, Mark Bernstein on nylon string guitar, and Robert Bard on upright bass. Unrestrained by boundaries of style, The Bernstein Bard Trio crafts every piece into something uniquely original and beautiful. Whether performing standards by Duke Ellington, Fats Waller, Django Reinhart, George Gershwin...; Latin or Tango by Jobim, Bonfa, Bizet...; traditional and popular melodies from around the world; the music of John Lennon, Sting, Paul Simon, Joni Mitchell, David Grisman, Jerry Garcia..; their own original compositions...BB Trio interpret it all with style and grace. The Bernstein Bard Trio is a New Paltz, N.Y. based trio featuring Steve Bernstein on mandolin, Mark Bernstein on guitar, and Robert Bard on bass. Whether performing standards by Duke Ellington, Fats Waller, Django Reinhart, George Gershwin; Latin or Tango by Jobim, Bonfa, Bizet; traditional and popular melodies from around the world; the music of John Lennon, Sting, Paul Simon, Joni Mitchell, David Grisman, Jerry Garcia; or their own original compositions,BB Trio interpret it all with style and grace.